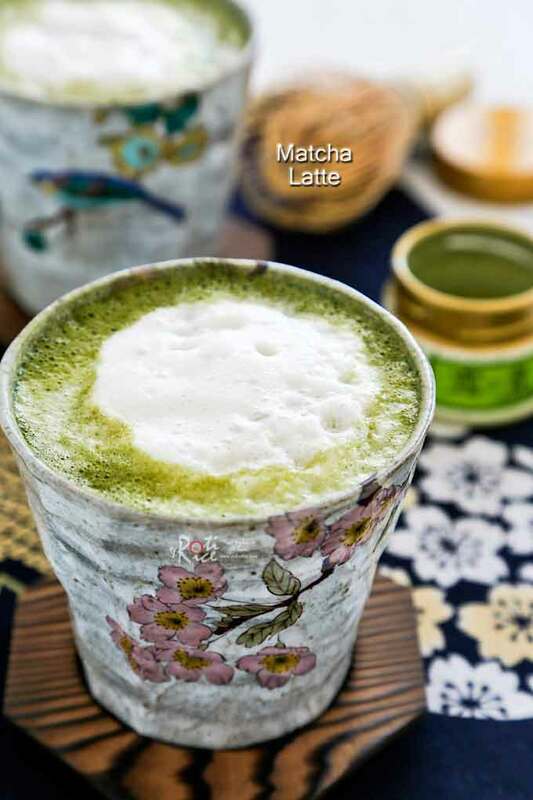 Frothy Matcha Latte, a delicious alternative to caffe latte. Matcha (green tea powder) combined with your choice of almond, soy, coconut or cow’s milk. The first time I ever tasted Matcha Latte was when I visited my parents in Kuala Lumpur in the summer of 2012. I was at a mall and Starbucks was handing out samples of their latest creations. As I walked past, the lady serving the drinks passed me a sample of their green tea frappucino. It was delicious but at RM14.00, I passed. Granted it is about USD4.00 when converted but one can easily get a cup of kopi (local coffee) for less than RM2.00. Of course kopi is not latte and you may not get the nice seats and wifi. Anyway, I got back to the States and promptly forgot about this green tea latte until I started seeing it popping up on the web. It appears like almost everyone was making Matcha Latte. Not wanting to be left out, I decided to give it a try as I almost always have some matcha (green tea powder) in my pantry. Now, I guess you can say both hubby and I are “hooked”. We enjoy this slightly bitter-sweet, jade green, frothy beverage and can’t get enough of it. I have made this beverage with almond and coconut milk as those are the 2 kinds of milk I have in my refrigerator. Almond milk combines well with the matcha and gives a creamier and richer flavor. Coconut milk is very neutral in taste to begin with and hence, it is a little more bland. You can also use soy milk or cow’s milk. If you are using sweetened almond, coconut, or soy milk, do not add any more sugar. It is an additional step but I prefer to sieve and dilute the matcha in some hot water before adding the milk. This is to ensure that you do not get little bits of matcha granules in your drink. I do also think that frothy milk tastes much better in this beverage. I initially used my immersion blender until I came across this handy little battery powered frother at Ikea. It is so much easier and faster with minimum clean-up. 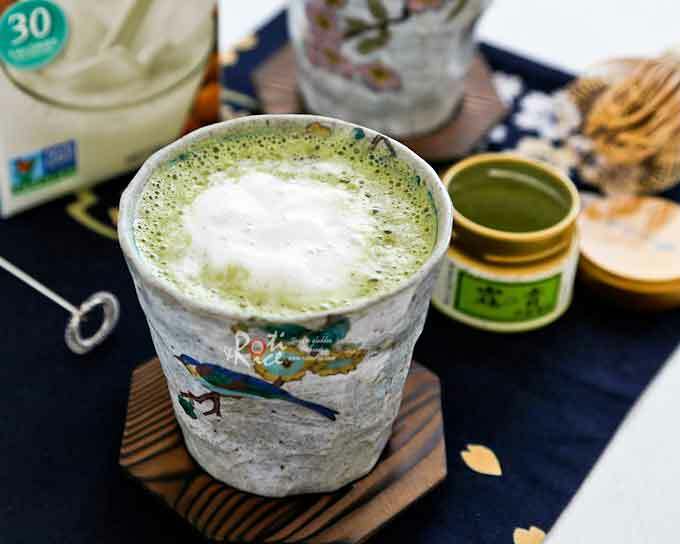 Frothy Matcha Latte, a delicious alternative to caffe latte. Matcha (green tea powder) combined with your choice of almond, soy, coconut or cow's milk. You will need a milk frother or a small whisk. Sieve matcha into a mug to prevent clumping. Mix with hot water. Froth or whisk the mixture for a few seconds to dissolve matcha. Heat milk and sugar in a small saucepan over medium low heat until barely boiling. Stir to dissolve sugar. Remove. Skip this step if you are making chilled latte. Froth or whisk milk for a few seconds. Immediately pour frothy milk into mug. Buy sweetened almond/coconut/soy milk for chilled matcha latte. The cold milk can be used straight from the carton. Oh how I love matcha lattes but I cheat and buy the powder mix. 🙂 I’ve never made it with almond milk and that sounds delicious! 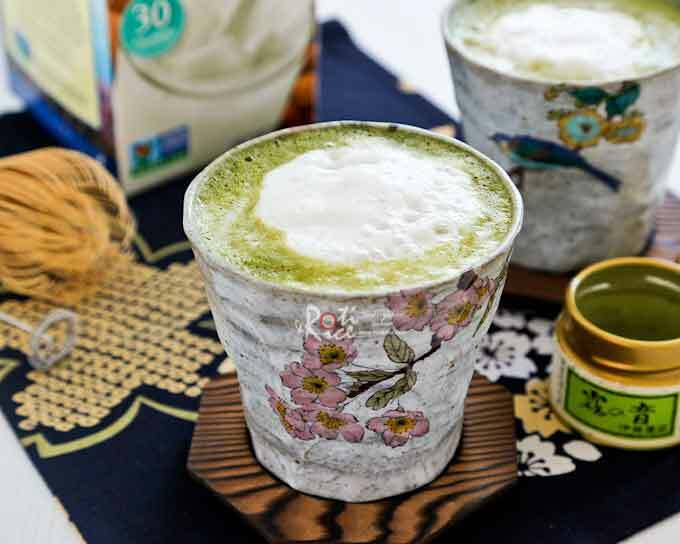 Great looking matcha latte!